Summary. This pictogram indicates the epicenter of the first preliminary cataclysm in the area of the Brazilian Magnetic Anomaly and the direction of further action as super-powerful tsunami which will pass through east coast of the North America . 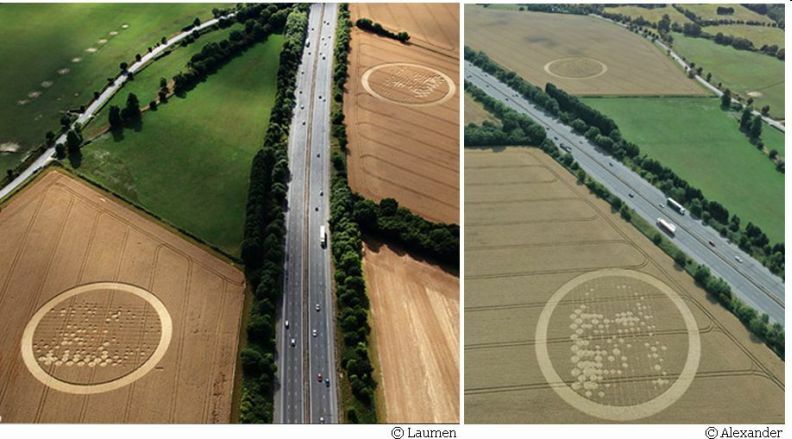 The intensity of human losses on both continents shows small and large circles, arranged in parallel lines. The road is the ocean that separates two continents – North America and South America presented by two circles. Ancient complex of Chan Chan in Peru supplements this information and indicates that the first pre-cataclysm will occur in the Pacific Ocean from outside Peru , at the intersection of Humboldt current, which runs from south to north, with El Niño, which runs parallel to the equator. 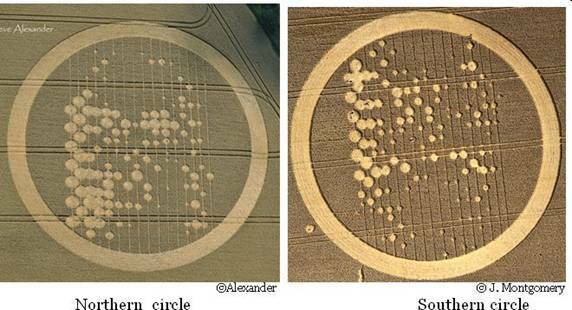 The crop circle shows two circles. They are located across the road from each other with some displacement – one circle to the south, and another – to the north. 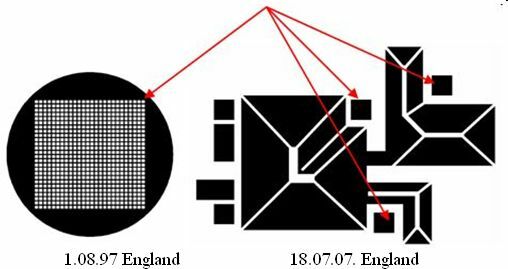 The direction of the pictogram reading is from the south to the north. Epicenter of the first preliminary cataclysm and the direction of its action. Two circles represent region of two continents – North America and South America , separated by the road which represents the ocean. The ocean, on the one hand, is a real road for ships. 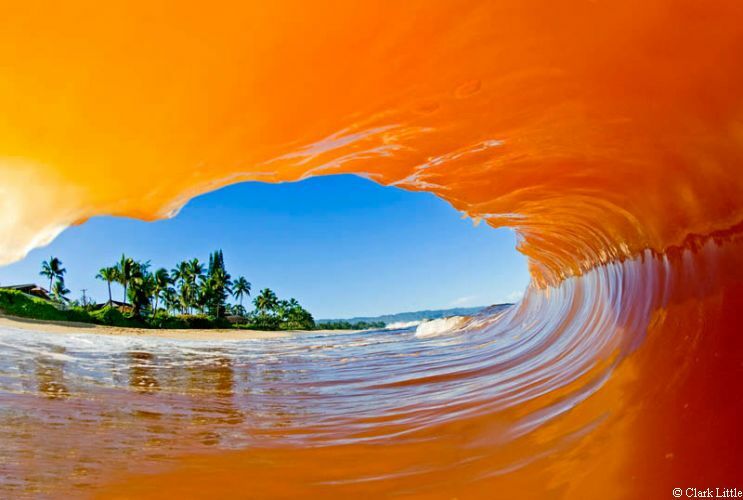 On the other hand, this is another state of matter: not ground, which present circles, but water. Two circles are located not symmetric towards the road. One circle is to the south, and another – to the north. The southern circle represents the region of South America concerning the Brazilian Magnetic Anomaly. 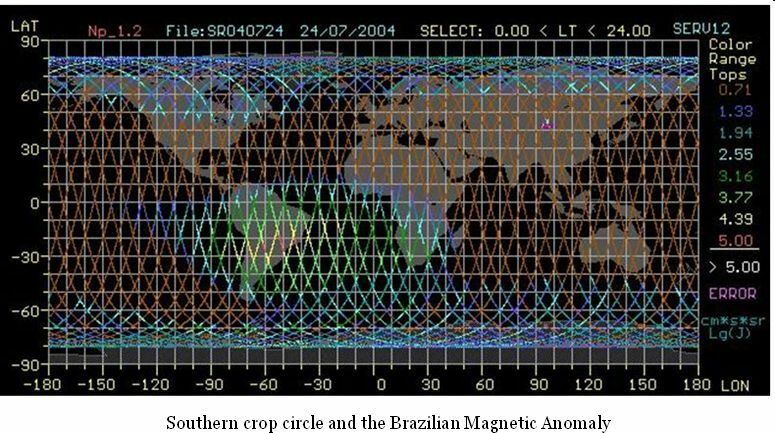 The Brazilian Magnetic Anomaly is a zone with one of the weakest magnetic field on our planet. Currently, scientists indicate the decreasing of Earth's magnetic field. According to scientists the major role in the life of the Earth plays its iron core with a firm kernel and an external liquid layer. They compose original «dynamo». It is considered that variations in the rotation of the molten component most likely determine changes in Earth's magnetic field. 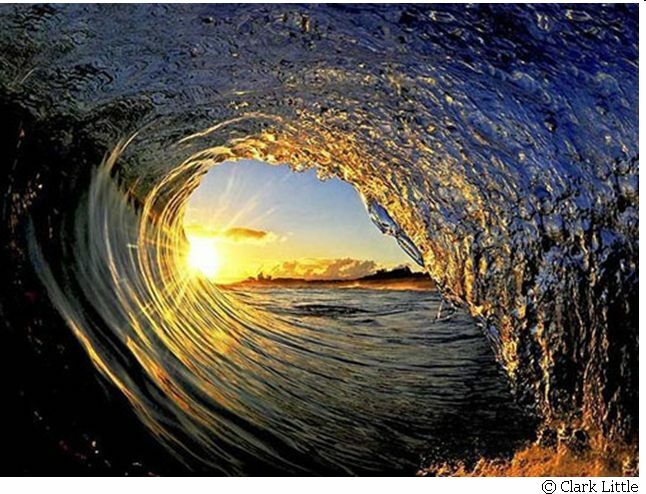 However, nobody is able to predict the behavior of Earth core. Earth core is not available by direct observation, so it is impossible directly to map its magnetic field. This can be done only indirectly, relying on the changes occurring both on the surface of the planet, and in the space around it. In addition, today scientists mark shift of northern magnetic pole with record speed in all time of supervision – 64 kilometers per year. Now it is located on territory of Canada near Ellesmere Island . Scientists connect this shift of magnetic pole with the newly arisen near the surface of the core area with rapidly changing magnetic field. This new area is formed, probably by abnormally moving flow of the liquid component of the core. Northern circle represents area of the east part of North America located along coast of Atlantic Ocean . Both southern and northern circles have many parallel lines. Thus, on a southern circle lines are perpendicular to the road. On northern circle lines are located at an angle to the road and directed to the southern circle. The arrangement of lines on a southern circle perpendicularly to the road means the following. 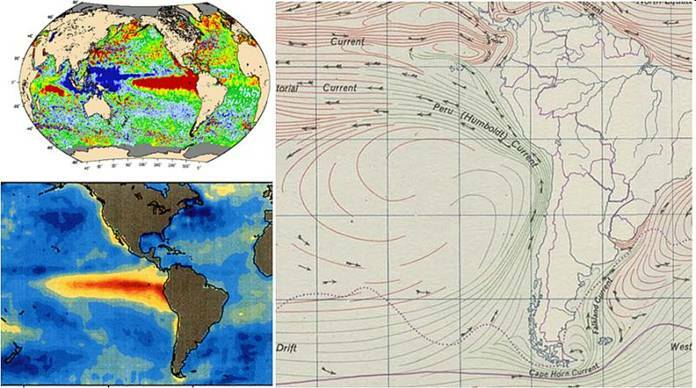 In the area of the Brazilian anomaly - located at the intersection of perpendicular currents of El Niño and Humboldt from outside Peru in the Pacific Ocean will arise the epicenter of the first preliminary cataclysm. Just in this place there will be a movement of tectonic plates. The circle shows losses of people in a zone of the Brazilian anomaly of the South America continent, as a result of the first preliminary cataclysm. The direction of parallel lines on the southern circle perpendicular to the road also indicates that the arisen movement will be transferred to the ocean presented by the road. Parallel lines on the northern circle of the pictogram directed to the southern circle inform that ocean, in turn, will transfer this movement to the northern circle. 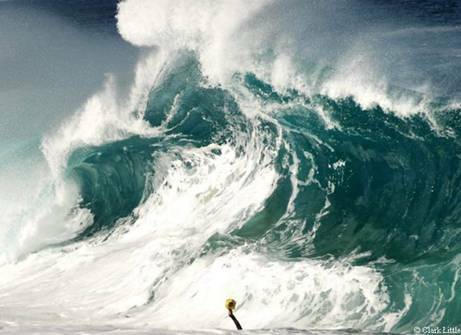 Hence, the movement arisen in the ocean will cause incredibly powerful tsunami which will pass through the east coast of North America . Information about the epicenter of the first preliminary cataclysm is presented in detail in the complex of Chan Chan in Peru . Humanity’ losses. On the parallel lines of the both circles small circles of different size as dots are located. They show the population of separate zones which will influence by tsunami of the first pre-cataclysm. So, it shows the first losses of our civilization. Near the southern circle there is a small single circle. This is an individual cell with a brain area in the centre, shown by a bunch of standing plants’ ears. It is given for comparison with circles-cells on parallel lines. Most circles-cells on parallel lines do not have in the centre bunches of ears. So, they represent brain areas of united consciousness cells. Only several circles have bunches of ears in the middle. They represent individual cells. Circles indicate that the majority of people are living with united consciousness: family, relatives, religious communities, communities by interest and others. However, there are very rare people with individual consciousness. In crop circles extraterrestrial civilizations already showed that losses of humanity in the first pre-cataclysm will be approximately about 6% of total Earth population. 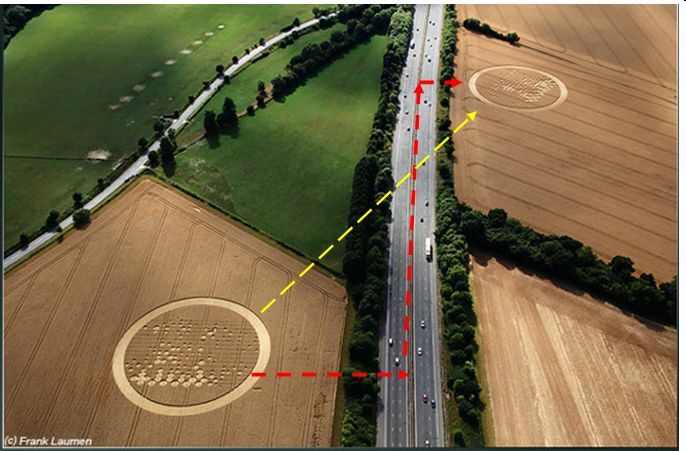 This information is presented in the crop circle appeared on 18 July 2007 in England . Losses of humanity in each of three preliminary cataclysms are shown as pulling in the corresponding pyramids. Full pyramid shows total population of Earth before the first pre-cataclysm – 6.8 billion people. Losses in the first pre-cataclysm are shown by a pulling in the most complete pyramid, located in the center. In 2010 extraterrestrial civilizations have transferred the most important instructions for the consciousness synchronization for the Transition into a new cycle of life on the Highest level of the material world. Without these instructions the united consciousness formation for humanity without experience and making the Transition for the first time, is impossible. Thus, in 2010 extraterrestrial civilizations have completely finished transfer their instructions to earth dwellers for the Transition. Transfer of the latest detailed information indirectly shows that the first preliminary cataclysm will happen in the nearest future. For this reason extraterrestrial civilizations consider extremely important to transfer instructions to mankind this summer. It will give opportunity to prepare for future events correctly. Apparently, in this process a huge role plays every day. For this reason extraterrestrial civilization decided transfer last instructions not in the next spring 2011, starting, as always, in April, but this summer 2010. Consequently, to prepare for the civilization’ united consciousness formation we have very small time. All of us - people of Earth should follow ETC instructions and fulfill them the best we can. These instructions are very simple - widely spread the information about upcoming cataclysms of the planet destruction and the Transition to the Highest level of the material world as the only one way to prolong our life. 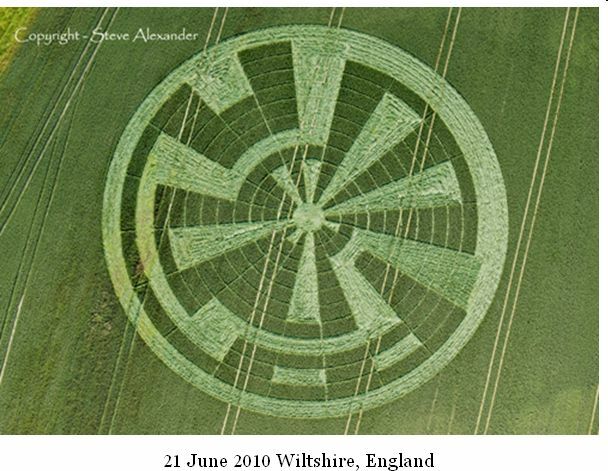 This instruction ETC transfer through many crop circles, among them is crop circle 21 June 2010 Wiltshire, England . This recommendation is related with disconnecting of phone and Internet communications in the result of super-powerful disaster. It can cause a panic. This will not happen, if civilization will be pre-informed. Extraterrestrial civilizations inform that humanity have not waited the beginning of global cataclysms. Immediately after the first pre-cataclysm we need to make the Transition to a secure the Highest level of the material world on the base of the united consciousness. ETC warn that after the second pre-cataclysm to make the Transition will be very difficult or even impossible. The united consciousness action of the remaining people would be insufficient to start the mechanism of the Transition. As a training for the Transition should be often organized huge groups of people for prayer and meditation. It's incredibly important for the civilization’ united consciousness formation. The main criterion for the Transition is to form the cell of the civilization’ united consciousness with a homogeneous high-resonant structure. Only in this case we can cause a laser beam, which will remove our body from the level of crystal structures, where will rage global cataclysms. At the same moment our new holographic body will occur at the Highest level of the material world. Hence, after general resurrection we will continue our life in the new cycle of Correction. All of us will be resurrected completely healthy - no injuries and diseases. To unite consciousness of civilization and to make the Transition in the following cycle of life is very simple – confirm ETC – this association will not affect anyone’s private property.